You are in Australia or you dream to have a career Down Under ? 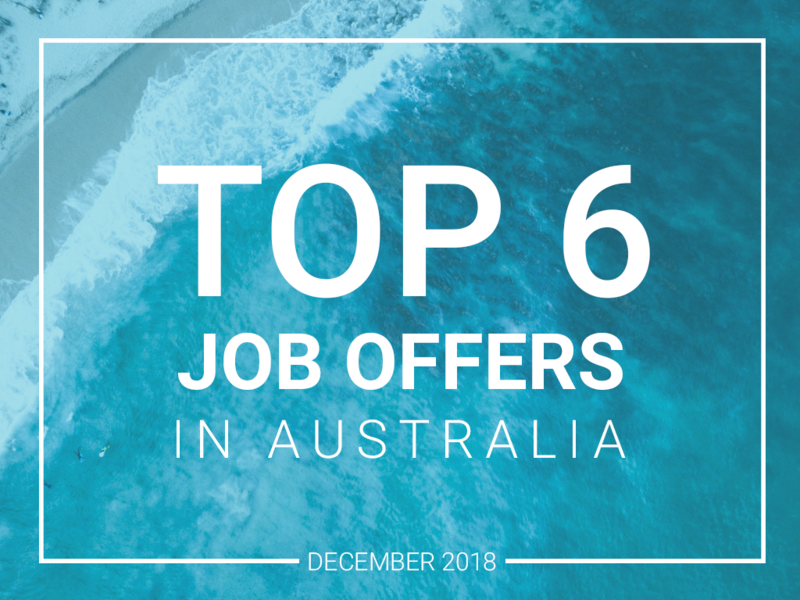 Have a look at those 6 job offers for permanent positions in Australia. 1. Marketing Manager, based in Sydney CBD. Industry: Shipping products and Pick-up & delivery services. This mature start-up (18 people at the office) needs a Marketing Manager to handle an important business strategic transformation and manage an innovative platform to promote their new range of mail products, in a word to coordinate its ambition to develop. As Australia’s biggest retail group, this company has the most trusted food, liquor and general merchandise brands. With the needs of their customers always changing, this group is looking for a Strategy Manager to enforce new initiatives. Support Group communications & reporting, including Board, ExCo and Delivery Office presentations. This leading Australian retail group needs a Strategy Associate asap! Reporting to Strategy Manager or Senior managers and divisional team members. This young successful tech start-up – has created a SaaS solution that enables organisations to provide a secure communication channel between them and informants, willing to disclose information anonymously. Today to cope with its fast-global expansion, they are actively looking for their Client Success Manager APAC based in Sydney (HQ and where the product team is based). Be the face of client success as the company communicates to prospects on onboarding up to up and running stage. For more significant opportunities, have conversations organised by sales about how you will help onboard the prospects and get them up and running, along with providing ongoing support. Ensure that the company has captured where the opportunity came from (how did they hear about the platform?). Together with sales, ensure a proper handover happens for each new client. In collaboration with the sales team, understand why the client needs a whistleblowing platform, why they chose our client’s platform, who the key players are, how they are deploying (countries, languages, etc), as well as their tech specific needs. Ensure each client is enrolled in the correct onboarding journey depending on the level of spend/package they are on. Review all new clients (in their first 60 days) every week to make sure all activities are happening, view their activity on the platform (logging in, responses to emails in terms of opens, clicks, etc. ), and if they are not on track, reach out via phone/email to move them along. Understand our client’s onboarding journeys, the messages/knowledge base being sent out, and consistently review these to see what needs to be changed, fixed, added, and amended. Survey clients and ask them to provide written testimonials / references on G2Crowd, Capterra or Case Study. Get confirmation on their ability to use our client’s platform for PR / marketing activity. Review each client’s usage (based on logins and activity in terms of opening/clicking newsletters, visiting resources, reading content) to get a better view of client health every quarter. Based on this data, engage with each client every quarter (if not already engaging with them) and get the right message to them. This can include a quarterly call for larger/medium sized clients and an email reach out for smaller clients. Highlight any perceived renewal risk. Provide updates & training to existing clients on any new features that are rolled out. Help put together the client newsletter with marketing teams based on feedback provided, issues that have come up, or knowledge gained from working with clients. Review all automation/workflows so that clients can understand what works and what is needed a personal touch for. Reach out to each client about their renewal 4 months before the renewal to outline pricing, contract dates, and the process to renew. Manage the sales process over 4 months to ensure a smooth renewal. Ensure the renewal pipeline is updated and reflects the current state of each client. Ensure all contracts are closed before the renewal date. Follow up with any late payments that are 60 days overdue. Where client satisfaction is high, ask for additional testimonial / video case studies. From time to time, client specific projects will come up that need to be managed. These include version transitions, specific communication about critical new features, etc. 6. Engagement Principal, based in Sydney. This client applies Internet scale technology to the challenges facing enterprise businesses, with the mission to solve the biggest, most intractable challenges of enterprise software. To cope with their expansion in APAC, they are actively looking for an Engagement Principal.